Bright yellow dandelions are pretty and their seedheads are fun to blow into the air, but there’s no place for them in a well-tended garden. First, a fun bit of background to think about for the many hours you’re pulling all those dandelions. Their name comes from the French “dent de lion”—tooth of the lion. And if you look at their leaves, they are indeed in jagged rows, just like a lion’s teeth. In most flower beds and other planting areas, the best way to control dandelions is to dig them out. The trick is to get the top two inches of the long, narrow taproot—or else they’ll come right back. When I was growing up, we used an old dinner knife to dig out dandelions. Perfect! But any narrow, sharp instrument will do. Of course, it’s essential to get dandelions early, before they set seed. Otherwise, thousands of dandelion seeds will be scattered all over your lawn. If you have a lot of dandelions, or they’re clustered in a spot set apart from perennials and other plants, you can use Roundup (or another brand of non-selective herbicide). Granted, I prefer not to use garden chemicals, but Roundup is one of the least dangerous for the environment. And Roundup is not magic. Use it on a sunny, warmer, dry day when it works best. And follow label directions, reapply every few days three or more times as needed. One of the best ways to control nearly every type of weed is to mulch. Apply two or even three inches of a wood chip or other mulch over the area. The mulch also will make weeding down the road easier, since dandelions can be more easily pulled out of the loose mulch. Bonus: If you have a neighbor who lets the dandelions in his lawn go crazy, mulch will prevent those dandelion seeds from ever taking root. If you’re diligent and your dandelion problem isn’t too extensive, hand pulling is certainly a good option. It’s a great job for kids—either your own or a neighborhood child. I don’t offer a penny a dandelion, the way my mom did. :-) But I do tell my 13-year-old son that he has to pull up 100 dandelions (and put them in a bucket so I can make sure he got the top 2 inches of taproot!) before he can have TV or computer time. But overall, most effective way to control dandelions in lawns is chemicals. Again, I apologize for offering a less earth-friendly option, but there it is. Decide for yourself. Most lawns that use a lawn service don’t have extensive dandelions. 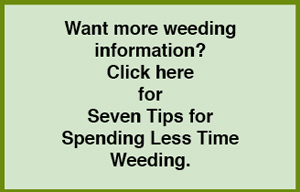 That’s because lawn services apply a “broad-leaf” weed killer at the optimum time in summer. This appropriately named weed killer destroys the broad-leafed plants such as dandelions and leaves the thin-leafed plants—like your grass. If you don’t use a lawn service, go your local garden center and check out the various chemicals that you can spread on your lawn that tout themselves as “broad-leafed herbicides.” Otherwise, simply look for something make for lawns that specifies controlling dandelions. Follow package directions exactly, especially on the time of year to apply the weed killer. Timing is everything. One note: Dandelions tend to be worst in thin, sparse grass. So a great way to prevent dandelions (and other weeds) is to do basic, regular lawn care that assures a thick healthy lawn that crowds out weeds.